I have recently read lots of people’s opinions, blogs, Facebook posts, etc. that are dealing with a wide variety of issues ranging from Christian theology to secular morality. To be honest, I have grown a little tired of the over-the-top chatter that I have been exposed to. I know it is my own fault for taking the time to read as much of it as I do, but considering that the field of influence that I feel called to plow is primarily on the Internet, I guess I just want to be tuned in to what other people are saying and why they are saying it. I realize that I am guilty of contributing to all of the digital clutter on the Internet through my own postings, so I want to be careful how I express my own opinions. I am all for being opportunistic in how we use the worldwide web to share the good news and I want to take every opportunity myself. I am all for being faithful to the Scriptures and for being true to our understanding of theology. The thing is, this medium that is responsible for you reading this blog, which has so much potential for good, also has an equal amount of potential for evil. It is this tension of how we express our opinions that I want to address this week. And so I want to talk about throwing stones. If you lived in the times when the Bible was written, getting ’stoned’ would have a completely different context than today. If you were looking for a big rock to hurl in biblical times, it would usually mean that you wanted to kill somebody. In a good way, we read how a young shepherd boy named David used a single stone to his advantage to take down a giant adversary. 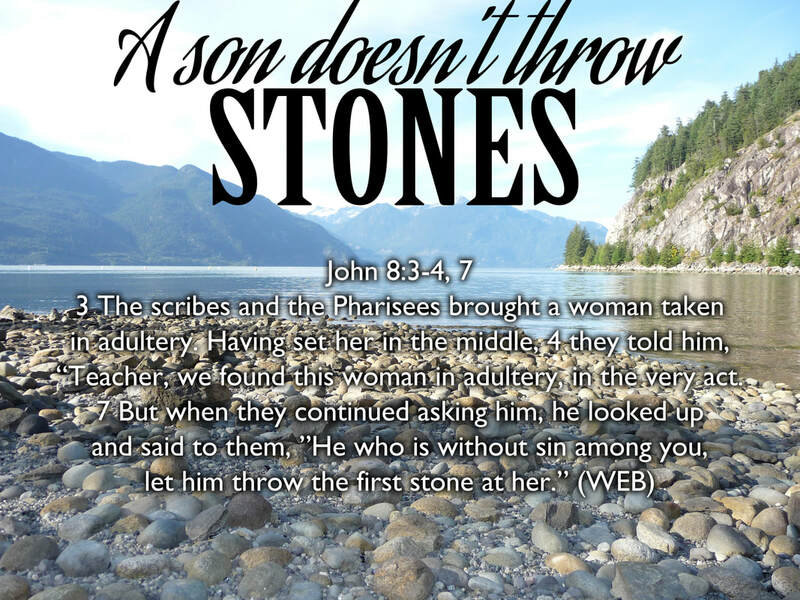 But most of the stone throwing we read about in the Bible served as a means for public execution. It was a way for the community to get involved in the judicial process and put an end to someone’s life who was found guilty of a crime worthy of death. So this is where we pick up the story in John 8:1-12 when the religious establishment of the day brought a woman caught in the very act of adultery to Jesus. Obviously they were trying to trick him into saying something that would give them grounds to accuse Him. After all, in their scorn, they called Jesus... ‘The friend of tax collectors and sinners’ (Matthew 11:19). So in their twisted thinking, they probably thought that this might be another opportunity for them to make Jesus guilty by association. I loved how Jesus responded to their ruse. Instead of playing their accusation game, He just stood in between the accusers and the condemned, just like He always did. Whether it was the tax swindling Zacchaeus or the Samaritan woman with more husbands than you could count on one hand, Jesus always stood with the broken, the wounded, the dishonest and the marginalized. He never seemed to care that his association with these ‘sinners’ actually affected his good standing in the synagogue. I guess that is why the Apostle Paul wrote in Philippians 2:7 that Jesus 'made himself of no reputation'. If our reputation is still important to us, then we might be more careful who we consider our friends. If we struggle with an orphan mindset, then our reputation probably is pretty important to us because that is all we’ve got. But if we share the same heart as our Big Brother, then the idea of being found guilty by association really isn’t that big a deal anyway. In a nutshell, if Jesus had a mission statement, it might have been right out of Luke 19:10 when He said… For the Son of man is come to seek and to save that which was lost. (KJV). I am so thankful that Jesus stood with the woman caught in adultery and protected her from those who would have gladly pummeled her into oblivion. In that moment, He was manifesting His own Father’s protective heart for a beloved daughter who was about to be brutally murdered by the very ones who claimed to be Yahweh’s representatives here on earth. When he stood alongside this dear daughter, He was standing alongside you and me too ...and I am so glad that He did! The thought that God loved us when we were powerless, when we were in darkness and when we were full fledged sinners (Romans 5:6-10) is really what the good news is all about! If you read the whole story, Jesus spent some time writing in the dirt during the Pharisee’s conversation about whether 'to stone or not to stone'. The Bible doesn’t say what Jesus was writing, but I have always thought that maybe He was writing the sins of the self righteous folks present starting from the oldest, down to the youngest. Sure, maybe their sin wasn’t adultery, but maybe it was pride? Maybe it was arrogance? Or maybe greed? Gluttony? Lust? Or the greatest offense of them all... the sin against love? The good news for that woman and the good news for us is that there is now no condemnation for those who are in Christ Jesus! (Romans 8:1) After dealing with our own accusers, Jesus says the same words to us that He said to the woman in this story… Where are your accusers? Neither do I condemn you! My prayer is that those words would ring as true in our hearts today as the day we got saved! Though we now have a new identity as God's beloved saints, may we always remember that our need for a Savior has not changed. We needed a Saviour when we first got saved, and we still need a Savior today. It is only when we forget our own need for God that we will lose touch with other's people's neediness and before long we will start hunting around for rocks to hurl at others. That was the problem that Jesus dealt with in this week’s story. The spiritual leaders of Israel didn’t think they needed a Savior. And that lack of need caused them to be uncaring and unaffected by those who they deemed as the dregs of humanity. Often the fruit of self righteousness is an inability to empathize with the struggles of others. It happened 2,000 years ago and it is still happening today. May our loving Father bring correction to all our hearts in the areas where we have wanted to pick up stones for the wrong reason. Does that mean we aren't supposed to bring correction to those we love? Of course not! Any loving parent would warn their child that the stove is hot and tell them that if they touch it, they will get burned! But correction is way different than hurling stones of judgement. Correction always comes in relationship and is offered in a spirit of humility. If we spend our time carrying each other's burdens, we will not have the inclination to throw stones. I don't know about you, but I've got a trunk load of issues that still need to be dealt with so I don't have time to sort out anybody else anyway! But the really good news is that our Heavenly Papa is patient and kind with all of us in the midst of all our struggles. He is really close to the weak, the needy and the broken. If we can believe that we fall into that category ourselves, we will be a little less demanding on those around us. I believe what the Lord is looking for is a people who love mercy, act justly and walk humbly before Him (Micah 6:8). When we truly become merciful as He is merciful (Luke 6:36), we will really have something of value to offer those around us. This is when the gospel will be gloriously displayed in our lives. So my prayer today is that we would learn as the family of God, to lay down our stones of judgement against one another and only pick up the stones designed to slay the giants in our own lives.